Derreck Kayongo has some amazing stories to tell. Kayongo’s journey from child refugee to fearless visionary is filled with moments of inspiration (along with the benefits of good, old-fashioned sweat equity) that make him one of the most popular – and authentic – speakers on the circuit today. From Africa to Atlanta with nothing but a dream and tenacity, Kayongo beat the odds, earned an education, and has served in leadership roles in some of the world’s most respected NGOs since 1994. Today, he shares his vivacious spirit and invaluable experience in the areas entrepreneurship, environmental sustainability, global health, social justice and professional engagement with audiences in both the corporate and not-for-profit worlds. 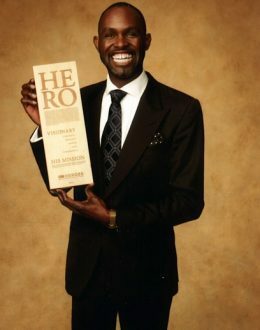 Derreck Kayongo’s ability to motivate others to understand the role their work and skills can play in problem solving is one of the many reasons he was a finalist for 2011 CNN’S Hero. Add to that the mantra of being a voice for the voiceless through his noble work of giving back, including dedicating his life to improving the lives of marginalized and vulnerable people across the globe: he has worked with the American Friends Service Committee as Program Director for the Southeast Peace Education program; joined Amnesty International as the Director of the Southeast Region; and currently serves as Senior Advocacy Coordinator for the Southeast region with CARE International. In 2009, Kayongo and his wife Sarah embarked on a new journey pursuing their life-long passion of starting an NGO of their own. The Global Soap Project focuses on repurposing partially-used soap from hotels into new soap for needy populations, particularly in Africa. To date, The Global Soap Project has been able to donate more than 300,000 bars of soap to over 22 countries around the world. In 2011, he was named one of the Top 10 CNN Heroes for his work. Since 1994, Kayongo has given more than 500 speeches on key issues related to poverty reduction in Africa; mainly on water and sanitation, soap, HIV/AIDS, Child Soldiers, Health and Sanitation, Impact of Landmines in Africa, Countries in Conflict and role of basic Education for Girls in Africa.